UL (ultralight) gear doesn’t always require you to shell out large amounts of money. While true UL items such as packs and shelters can be quite expensive, there are quite a few items that can be made which are very inexpensive. And a kitchen set-up is one of them. Of course, the most UL kitchen is the non-existent one, but for those that like to have a hot meal (or drink), even if it is only every now-and-then, can still go quite light for a very little amount of money, and just a little bit of time. 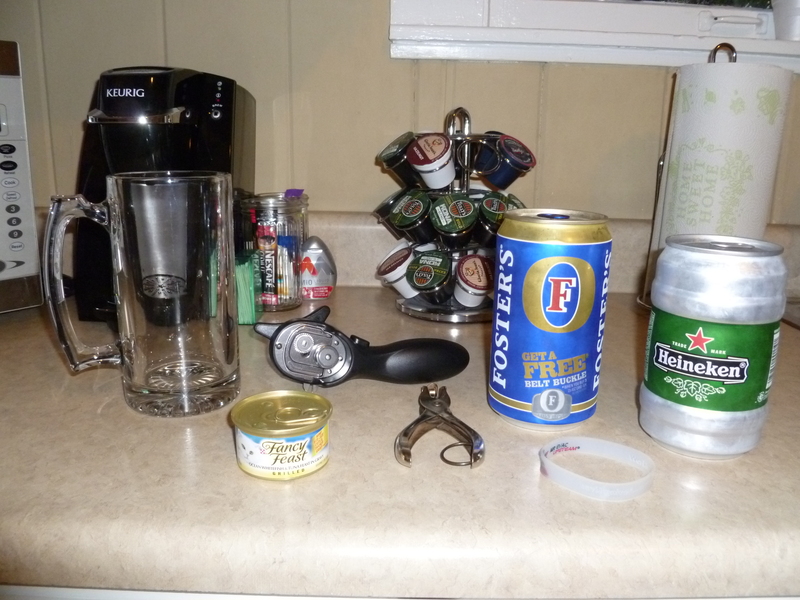 So, as you can see I had a little trouble getting the can opener to work properly. But I didn’t give up, I got another Foster’s and also decided to try a different style of a side-opening can opener to try as well. However, after destroying a couple of Foster’s cans and almost a 12 pack of soda’s I decided to call it a night. But the one lone Heine pot still remained, untouched…and waiting. In case you don’t know, the way these side-opening can openers work are quite neat. They actually score the lip at the top of the can rather than the actual can under the lip. This allows the lids to actually still fit inside the top of the can so they indeed make the perfect lid for the can. Also, with the way it scores and cuts the lid, it is not supposed to leave a sharp edge. Unfortunately since I have not yet removed the top off of a can in the way that these can openers are made to do, I cannot attest to this. So, this morning, I was still afraid to use one of the can openers on the one and only Heine can. So, I decided to do it the old-fashioned way. I stacked up books until it was at the right height so that I could set a utility knife on top of the books and align the blade in the middle of the lip on the top lid of the can. Then I turned the can…and turned…and turned…and turned…and turned… After about an hour of turning, I was finally give-in. I decided to give the can opener one last shot. If it worked, it worked, if not, then I would just be without. And it worked! Now, before I start talking about all the specs and such, I want to talk about the stove and pot stand a little bit. I mentioned above that I wanted a stove that would position the flame directly under the Heine pot. To start with, I am no stove expert, but the reason I say this is because in my mind, the more of the flame that is under the pot, rather than licking up around the pot, the more efficient the stove is at actually heating the water within the pot. Also, the faster the water gets heated, less fuel gets used, so to me, this seems to be more fuel-efficient. Of course this can also translate to mean a lighter pack, because the less fuel needed, the less fuel carried and the less amount of weight in my backpack! This worked fine, and the hardware cloth was pretty light, however, it was not very durable. After bending it back and forth a few times to store and then to use it, it would easily begin breaking. Plus , I still had to put a windscreen around the entire set-up. That is when it hit me. The windscreen I will be using is actually a windscreen that I got when I ordered my White Box Stove. It is made of a thin, but very durable piece of aluminum. So, I opened my windscreen and set it to the diameter that I wanted and then simply ran the stakes right through one side of the windscreen and then out the other side. By doing this, I managed to use my windscreen as not only my windscreen, but also as my pot stand! This means one item is doing double duty, which means less weight! The nice thing about this as well is that with the weight of the Heine pot sitting on the titanium stakes ran through the windscreen will also hold the windscreen down. This is nice because I have found it a little annoying when a breeze comes along and starts blowing the light-weight windscreen all around my stove and cook pot. So, without running on, I will wrap this post up with some listed specs. 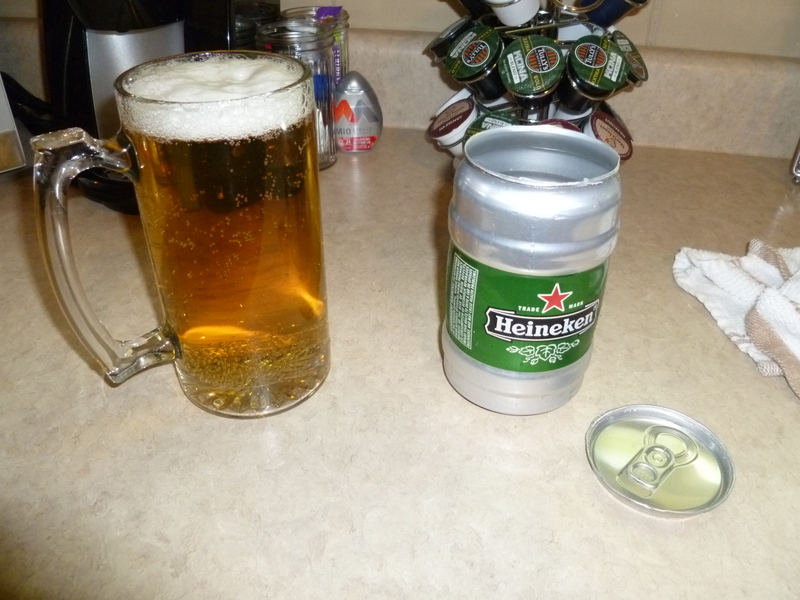 Heine Pot with Beer Band: 1.2 oz (35 g) ~ Cost me $2.50. Already had the band. Heine Lid: o.2 oz (7 g) ~ Came with the can. Stove: 0.2 oz (5 g) ~ 3 oz can of Fancy Feast cost around $0.75. Windscreen: 0.9 oz (25 g) ~ Already had, came with $20 White Box Stove Set. 2 Paper Clips: 0.1 oz (3 g) ~ Practically free. Mountainfitter 7″ Ti-Eye Stakes: included in my shelter weight. Cost $2 each. So, that is a total of 2.7 oz, or 79 g for what could easily be my entire kitchen set-up, minus an eating utensil. And it actually only cost me $3.25 to buy the Heineken and the Fancy Feast cat food can. Granted for someone else to make this same set-up and use it the same way I do, they would still need to make the windscreen, so a little more money would need to be spent on some aluminum, however I have heard that some can be found in arts and crafts stores such as Hobby Lobby. 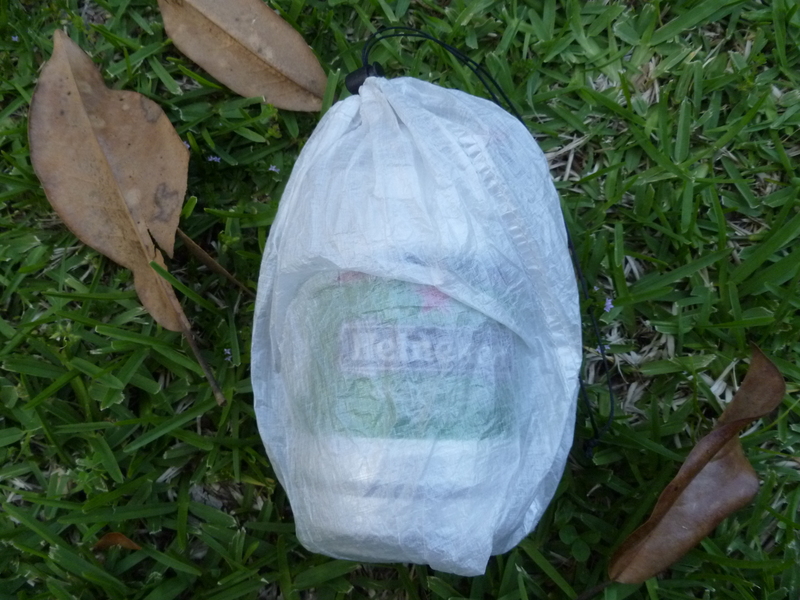 Also, I already had the stuff sack, and $10 is not a bad price, but there are less expensive methods. Simply buy some cheap ripstop nylon at a local fabric shop (or Wal-Mart) and one can easily be sewn. So, anyway, I will stop running my mouth, err…my fingers now and end this post. I appreciate you spending your time to read this and watch the videos. Also, one last thing I feel the need to mention…I have made a lot of references to the term UL in this post, but I am not claiming that I am an actual UL backpacker. I am more of a happy “light-weight” backpacker. I was just using that term to point out how light-weight this cooking system is. Anyway, now that that is out of the way, if you have any comments, please be sure to leave them below and I will be sure to get back with you! Until then, here is a picture of the entire set-up in the stuff sack and ready to go! This entry was posted in Cook Kits, Gear, Stoves and tagged alcohol stoves, Backcountry.com 700 ml Titanium Cook pot, Backpacking cook system, chimney alcohol stove, Fancy Feast Cat food can, Foster's cook pot, Gram Weenie Pro Stove, Heine Cook Pot, Heinekin Mini Keg, lightweight stove, Mounainfitter 7" Ti-Eye stakes, open flame alcohol stove, side opening can openers, Super Cat, tent stakes, Titanium cook pot, Titanium Stakes, UL cook pot, ultralight cookpot, ultralight stove, white box sove, windscreen, ZPacks cuben fiber stuff sacks. Bookmark the permalink. Good post. I discovered Jim Woods’ Fire bucket which is also a windscreen and pot stand in one. Can also burn wood or fuel tab or alcohol stove. Anywho, you had a good idea there. I didn’t know Heine kegs are hard to find. Happy camping and thanks for the contribution to the DIY backpackers universe. I have seen those fire buckets online, but never in person. And yeah, Heine kegs are no where to be found now… at least not in the southeast US, and I would wager in any area of the US. – Can use after shelter is setup or in shelter vestibule in bas weather (I always setup my shelter before cooking in case bad weather rolls in) as no tent stakes are needed. – I need a pot stand because I use sticks on the trail instead of stakes for my shelter. – Lighter alum foil for lid can be used to funnel water into a water bottle when water is scarce. -Tealight candle instead of cat food can. Lighter and one full tealight = one full boil for 1+ cups of water. No need for carrying measuring cup or worrying about quantities of fuel (There are larger tealights for winter camping and for boiling larger capacities). – No silicone beer band needed (Carry a bandana that doubles as pot holder and is multi use item). – Can use either alcohol or solid fuel for this setup (just put the weber lighter cube in the tea light). I guess I will also have to break down and drop the top on the Heine and use foil. As for my pot support, I like having the 2 extra stakes for just in case I lose one or break one. Also, since they are extras, I can still use the set-up after I set-up my shelter. I have toyed with making some out of the hardware cloth but I liked the stakes better. The weber cubes are very cheap and readily available at Home Depot…but they don’t keep for weeks outside their original 24 pack. For weekend trips they are great/cheap/light. But longer than that, I have not tried it. The sucky part about solid fuels, is that for extended trips you need esbit which costs more…and the extended trips are where the weight savings over alcohol really show. Handling the soot is reasonable. I use a plastic bag from some rice cakes. It is decently durable and has the right diameter to hold the heiny. It adds minimal weight. Gotcha on the stakes, that makes sense for your setup. For my Heine set-up the stove is 2-5/8″ in diameter and the base of the Heine pot is 3-1/4″ in diameter. The stove is an open flame alcohol stove though, not a Super cat. It does not have any holes in the sides. I simply pour the fuel inside the can and light it. Without the holes in the side, the flame is concentrated upwards rather than out, which keeps the flame under the can rather than licking up the sides. Here’s another idea instead of tape. Hey Stick! Good job on the Heine pot cooking setup. I’ve been playing around with this type of setup for awhile now also and find it really fun to mess with. Like you, i’m not sure if it will replace my current setup, but it’s still enjoyable to mess with and try different things. Definitely try some drywall tape around the center of the heine pot, it works really well and after a few days the stickiness wears off the outside of the tape. My pot with the drywall tape is 1.7 oz (includes a small dowel rod that’s screwed into the top to be used as a handle), so it will add a little more weight but its worth it. I’ve made a supercat in the past, but really never thought of just letting it be an open burner. I’ll have to give that a try! Also liked the way you put the windscreen together with the tent stakes. Seems like that would make a nice and stable platform. Thanks for the tip. I will look into that tape. I was debating getting some of the fiberglass wick to wrap around it too. I wouldn’t mind having some of that on hand anyway for when I try to make other stoves. I like it. Good job. I wish we could get those Heinekin cans in the UK. It is about to the point where it will be hard to get them from anywhere now…bummer cause they seem to be pretty nice. Great Post! I’m really starting to like the way you do things. I (also) had no idea that this type of can is hard to find. Where do I look? Good luck with Heinekin ;-). 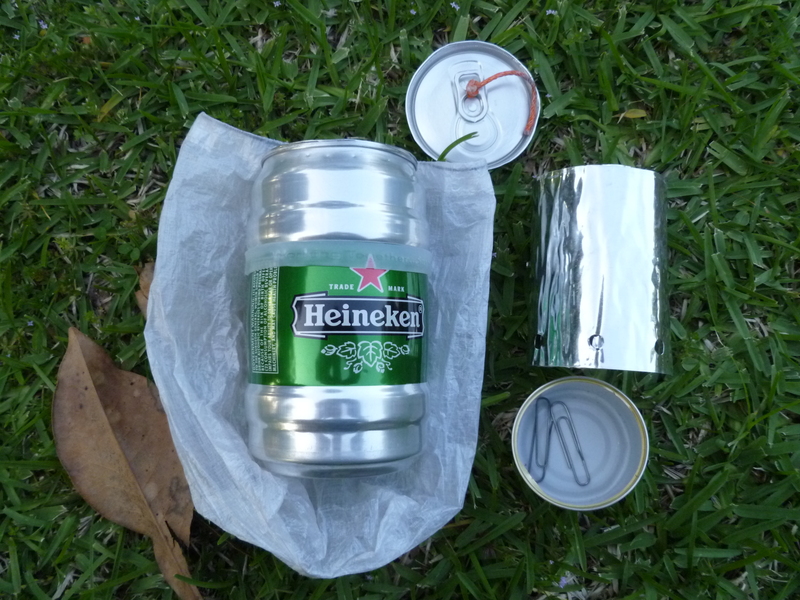 They sued Tinny for showing the image of their can made into a cookpot, and have frowned on the UL hiking communities use of their cans for cookpots. I tried to buy empty cans from the manufacturer a couple of years ago and was told Heineken wouldn’t go for it. Wow, I did not know that…thanks for the heads up. At least I won’t waste my time with asking them now. So, did they really win that suit?